Mash yams. Mix everything else in. Heat on stovetop until hot. 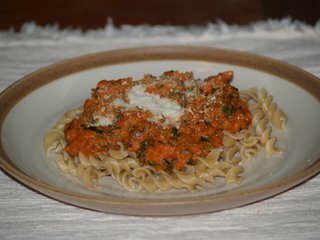 Place yam mixture on top of pasta. Sprinkle parmesan cheese or nutritional yeast (I would have if I had it) on top. Serve. Anyway, I thought it was pretty tasty and seemed like a good combo of veggies. I can only assume that Ava liked it. 😉 I wish I could give you Jody’s take on it, but he hasn’t had any yet. He’s been out of town on business the past few days and gets home tonight. Yay! I’ll be sure and have him test out some of the leftovers. 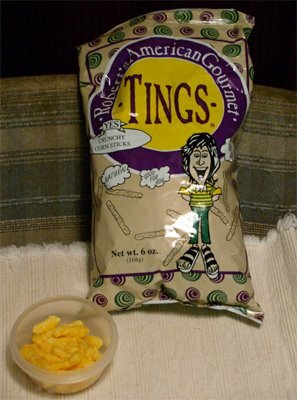 Now let’s talk about Tings. They remind me of Cheetos, but don’t have any cheese in them. (They are actually a vegan food.) However they do have nutritional yeast, which has a cheese-like taste to it. I recently found a Yeast Meets West website listing all of the benefits of nutritional yeast and I have to say, I’m quite impressed. So not only are Tings a yummy snack, they are good for ya too. 🙂 I have to add that Ava LOVES them. Yams are not grown here, I don’t have any idea about them but it looks tasty! isil – thanks. wow, that’s interesting about the yams. you are in turkey, right? Yes, I’m from Turkey (Istanbul). I’ve not tried Tings, but Fruity booty and Veggie booty are main stays in our house. I’ll have to try them. Gina – Veggie booty is a mainstay in our house too. R2Ks – Hee, hee. Look out SOS! And thank you. I saw these at Whole Foods before I went on vacation. I bought them thinking of you. I read the back and it took me forever to realize that it’s written with a Jamacian accent. Duh! 😉 That’s exactly how I would describe them, just like Cheetos. That’s what I told my friend. My daugther loves them, and I’m so happy becuase now I can give her these instead of Cheetos. They really are good!